I am a Hertz Gold Member. On May 4, 2015, I picked up my reserved rental at the Florence airport in Florence Italy. After an incident-free holiday, I returned the vehicle at the end of my rental period. 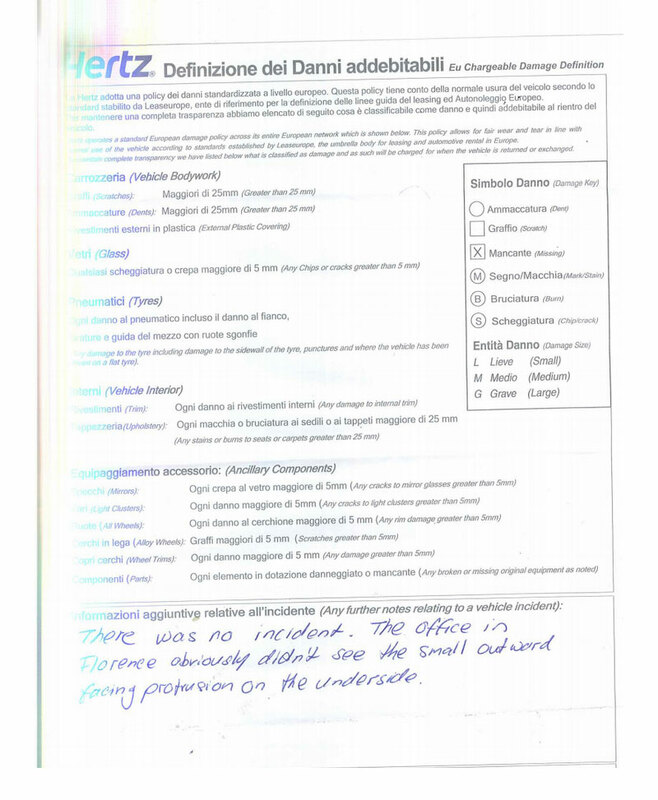 The Hertz representative in Lamezia Terme proceeded to circle the vehicle, inspecting every square inch for damage. After finding nothing visible the first time, he went around several other times, at least five, looking at all the door panels, undercarriage, trunk, roof, etc. It appeared he was trying very hard to find some issue with the vehicle. After he had gone around the vehicle five times, he knelt down and scrutinized a small area where the front air dam meets the undercarriage, and stated there was a small protrusion there for which I was responsible. I did not collide with anything, back over anything or otherwise have any issue during my rental. I was charged EUR 198 plus tax for something for which I was not responsible. The protrusion was so tiny that it was probably missed in Florence and we certainly didn’t notice it when we picked up the vehicle. It took the representative five inspections of the vehicle to even notice it. Needless to say we were shocked at being accused of damaging the vehicle. We had a flight to catch and could not spend time arguing with the representative. We took photos of the spot and were told to contact you upon our return. I trust that this is all a misunderstanding and that Hertz must take into account normal wear and tear on its vehicles, and deal with the fact that employees sometimes make mistakes. I would like to request that the EUR 198 plus tax be refunded (we were already charged EUR 110 for a second driver, which is normally much less) as well as some other random fuel and theft fees. We were very surprised at all the extra fees when we picked up our vehicle. Our reservation was initially for EUR 352 (“guaranteed rate”) - then it went up to over EUR 648 when we got to the counter. That’s already EUR 300 more than the quote. Now they’re trying to charge us for some small protrusion we didn’t cause. The final invoice came out to over EUR 800 - which is EUR 457 more than we were quoted. This has never happened to us before when renting with Hertz, and we find it deplorable. We hope for a swift resolution. We receive lots of complaints from rental customers, who have issues with rental suppliers. This is the most common complaint (fees for non-existent or & pre-existing damages) along with overpriced insurance, overcharging and invoicing errors. We recommend our customers to take photos or even better video of their vehicle on pickup and on dropoff so they don't get hit with any dodgy fees. 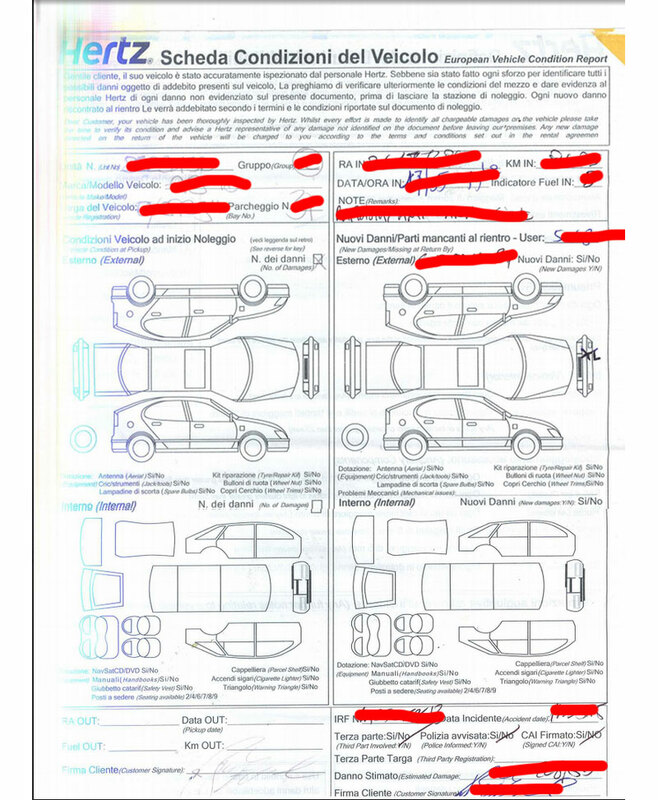 Fill out the vehicle report you are given at the rental desk and hand it back to them to sign off before departure. Do you know what the best thing was about this whole incident? 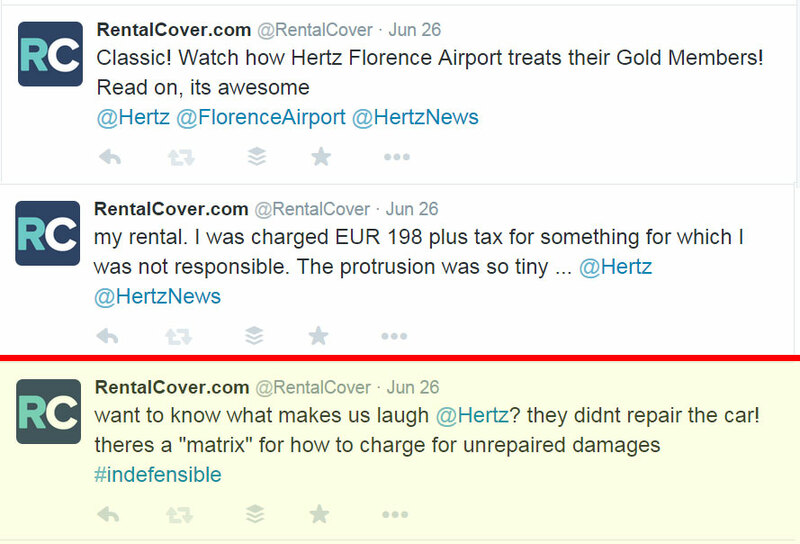 Hertz didn't even repair the car with the money they received for damages!